After halting gas supply to Europe in September 2014, Gazprom has increased the supply volumes dramatically to the level of early 2014, Kommersant daily writes. According to the source, transit via Ukraine grew almost 40%. About 70% of the additional gas was supplied to Italy, the remaining to the southern Germany. In addition, Gazprom has nearly doubled the gas supply via Nord Stream - approximately up to 95 million cu m of gas daily. The Yamal-Europe pipeline load increased 19% to 82 million cu m daily. The additional gas supply was shared between Germany and the North-Western Europe almost equally. Gazprom refuses to comment on the drastic growth of the gas supplies. To recall, in September 2014, Gazprom reduced gas supply to Europe to control the “reverse flow” to Ukraine. Later, Gazprom minimized gas supply through Nord Stream and Yamal-Europe – this was to lead excessive use of gas reserves from the gasholders and prompt price hikes in the spot market, which, in turn, would make the reverse to Ukraine unprofitable. Nevertheless, the gas price in the spot market did not change significantly even after the European underground gasholders were nearly run out of gas reserves. The paper’s sources in the monopolist company explain the increased supplies with the March 5 meetings in Moscow. President of Russia Vladimir Putin received Prime Minister of Italy Matteo Renzi, while Rainer Seele, head of Wintershall - one of Gazprom’s oldest partners in Germany - visited Aleksey Miller, the head of Gazprom Company. Experts say Seele could persuade Gazprom to increase supplies, or Renzi and Putin could achieve some political agreements, for instance, over European sanctions. 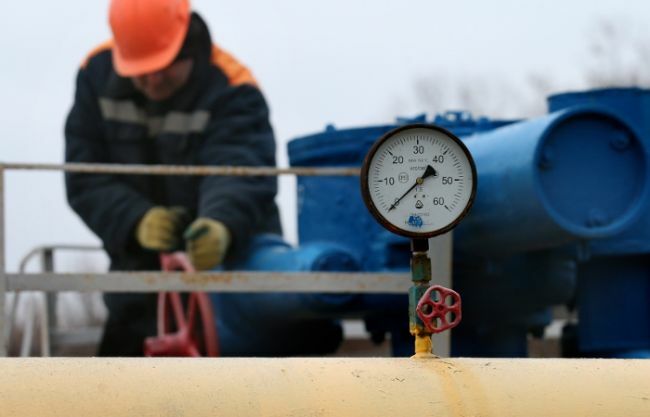 Gazprom’s decision to increase supplies was unexpected for Western Europe. Gas companies had no special concerns over the shortage of gas. “Now, the LNG on the spot market in the Western Europe is available for $250 per 1000 cu m and there is no demand for the Russian gas,” the newspaper writes citing one of its sources. “Today we will buy gas for $245 under reverse deliveries,” Poroshenko said. He said Ukraine has fully diversified the supply mechanism thanks to his team. “We have talked and dreamed of that for 23 years. We, my team did it, finally,” Poroshenko bounced. In the meantime, Kommersant writes, with the increase pumping volume, the situation in Ukraine has deteriorated. “Naftogaz” again blames Gazprom for breaking the contract, claiming that the monopolist has no right to increase the daily flows so suddenly. The Ukrainian company was reluctant to refuse from pumping into the underground gasholder and start gas offtake. If this continues, Naftogaz will have to make the next pre-payment already today, on March 10.